When people watch American Idol (and other shows) on TV they see little of what goes on in the "background" of the production. Many of TV's viewers will never see the strange people I encountered, the grueling dedication contestants had to give to the show or the sheer size of how massive the auditions were. 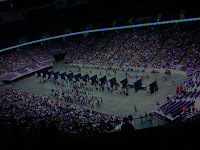 I left my apartment at 4:00 in the morning for the Idol Auditions which were in East Rutherford, NJ at the Izod Center. After an hour of driving I arrived to find a massive car line for people who did not have E-Z Pass. Luckily for me, I had E-Z pass and was able to escape the massive car line from people who had come from all over. After waiting in line from 5:00 am to 8:30 am we were finally let into the actual stadium itself. I had pre-registered the day before and thought I had made a smart decision and would be at the front of the line. Turns out everyone had pre-registered and I was very close to the end of the 18,000+ contestants. So for the rest of the day I walked around past teenage divas who had dragged their parents along for the misery, misunderstood "superstars" who had yet to become discovered, thug types who "thought" they could sing and various other interesting groups. I did not get auditioned till 10:00 pm. For those counting, that was 18 hours from the time I left my apartment till I was seen. Even though I had brought a backpack full of food, I battled hunger, insanity and off-key singing all day. Would I do it again? Probably, the experience was something I was glad I had, so I could know exactly the struggle and dedication it takes to become a "star".